Holly Shaw: What is It About Mint Milanos? They are small and light. They almost melt in your mouth. A couple of bites and then I think well, just one more. Soon I look down and half the bag is gone. Do I stop? It depends. Chocolate can be rationalized. The other trap is that they have been on sale at Target the last few weeks. I have become addicted to Pepperidge Farm Mint Milanos! This morning Amber took my measurements and made me step on the scale. So now I am repenting of all the many mint milanos that found their way to me. It wasn't terrible, but not as good as it should have been. I lost 5 pounds, but most of my measurements stayed the same. Grrr. Amber wants to start seeing my food journal again. Grrr. I know that food is still my downfall at times and it interferes with my progress. After a long run or a half marathon I sometimes reward myself for a day or two or three. I need to commit these next 4 weeks to stay more on the right track (I'm not saying exactly perfect) and THEN see the results. One day at a time. 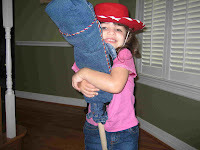 On another note, Annelise had Rodeo Day today at school and came home with a darling stick horse made from blue jeans. 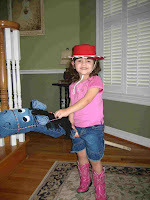 She rode it to the car and then into the house. Soo cute! Giddyap.